In the mid 1960’s, the Upper Makefield Business and Professional Men’s Association decided that Upper Makefield Township needed its own fire company given the community was transitioning from a predominantly rural to a more suburban area. At that time, the Yardley-Makefield Fire Company, Union Fire Company of Titusville, NJ, New Hope Eagle Fire Company, Lingohocken Fire Company and Newtown Fire Association responded to fire and emergency calls within the township and collected donations from township residents to help fund their operations. 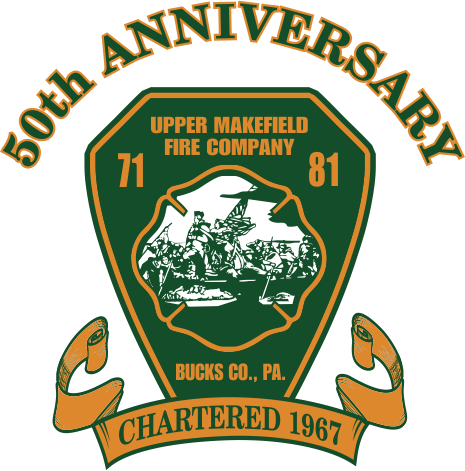 The Upper Makefield Fire Company (UMFC) was incorporated in December 1967, making it the youngest volunteer fire company in Bucks County. Its initial priorities included obtaining equipment, building a firehouse, and recruiting and training firefighters. 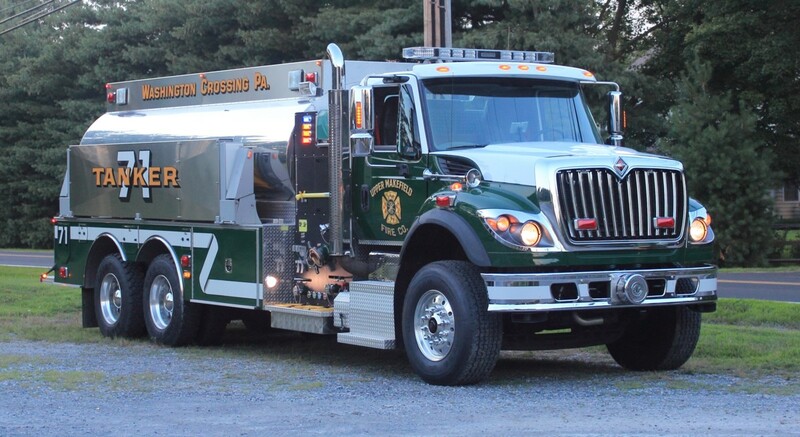 With the financial assistance of several members, the new fire company purchased a 1940 Mack pumper from the Midway Fire Company and housed it at Saxton Brothers Excavating on General Hamilton Road. 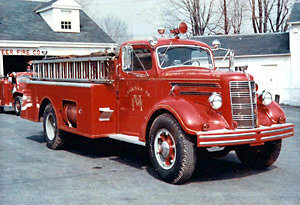 A second truck, a 1946 Hahn pumper, was secured from the Northampton Township Fire Company and housed at McKissic’s Service Center (now the home of Skerdlant’s Shell). During the spring of 1968, the partnership of Kudra & Bailey donated the land on which the Taylorsville Rd. firehouse (Station 71) now stands. Building materials were purchased with the proceeds of a local bank loan. Maurice Creighton, builder, and William Kaye, plumber, were the principal leaders of the project and donated many hours of their time. In less than six months, Saxton Brothers cleared and graded the land and the community’s first firehouse was built, with labor donated by many of the same individuals receiving firefighter training. As the firehouse was being constructed, volunteers also attended training. The Newtown Fire Association offered their facilities, personnel and equipment to help with the training effort, and William Geiser, Fire Chief of Willow Grove Naval Air Station, volunteered his time as the group’s instructor for the 15-week course. Each Wednesday night, the volunteers headed to Newtown’s firehouse to learn the basics of firefighting. The eclectic group of 31 men included doctors, teachers, engineers, a barber, insurance agents, carpenters, accountants, electricians, store keepers, a plumber, sales representatives, truck drivers, business managers, excavators, farmers, factory workers, architects, auto mechanics, and a used metal handler. Collectively, they mastered skills such as manning hoses, climbing ladders and ventilating buildings. Among the trainees was Fletcher Weeden, insurance agent and township tax collector. Though confined to a wheelchair and unable to fight fires, he helped the department administratively, raising funds and recruiting members. Training complete, and with two trucks and a newly-completed firehouse, the Upper Makefield Fire Company received its charter from the Commonwealth of Pennsylvania on November 17, 1968 with 50 members on the books. For the first three years, the Newtown Fire Association responded simultaneously with UMFC’s fledgling firefighters on all calls. From the beginning, firefighters were equipped with radios for dispatching. Truck drivers headed to the firehouse, while other firefighters responded to the scene. Population and housing unit growth accelerated in Upper Makefield Township from 1970 to 1990, and the UMFC needed more equipment to serve the community’s needs. 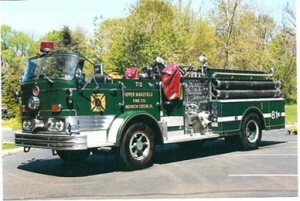 In the mid-1970’s, the UMFC purchased a 1965 Mack open-cab, hunter green pumper from the Bryn Mawr Fire Company. 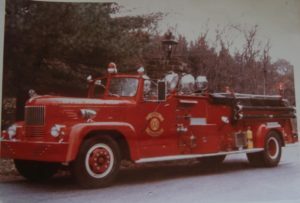 At the time, the UMFC did not have the financial means to repaint the truck red, so it remained green. 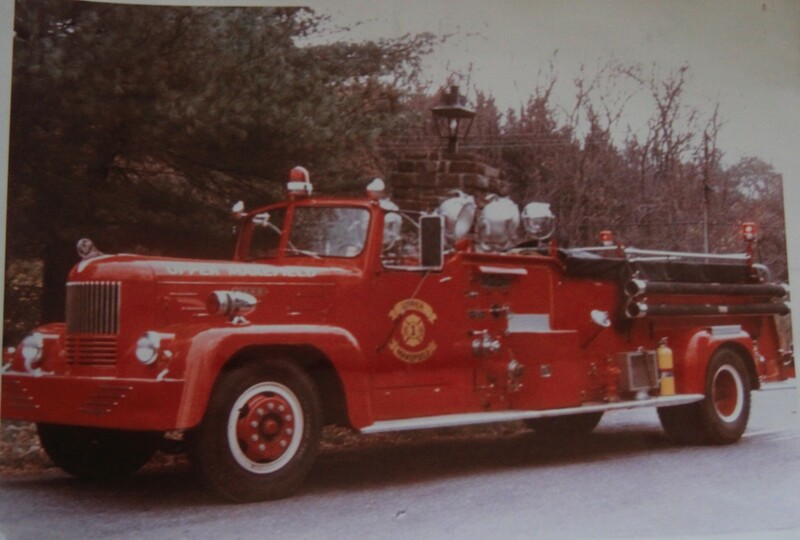 A few years later, the UMFC purchased a 1969 Mack pumper with a partially enclosed white cab from the Horsham Fire Company. Given UMFC was a little more financially sound at this point, it could afford to paint this truck to match the 1965 Mack. All UMFC trucks from that time forward have been painted the same hunter green color. In 1982, members worked evenings and weekends to add a meeting room to the four-bay firehouse. The room still stands today as a lounge for all members to hang out, relax, watch TV and tell stories of the fires and rescues of the past. The room has numerous pictures of incidents that the company has been involved with, a shelf filled with trophies from parades starting in 1967 and a whole wall commemorating September 11, 2001. The room is dedicated to Charter Members Donald Saxton and Gerald Saxton “who gave more of themselves, than they themselves know”. 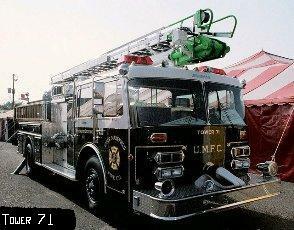 In 1985, the UMFC purchased its first new fire apparatus, a Grumman/Duplex Telesquirt with a 55’ boom. The truck served Upper Makefield residents for 20 years until it was sold in 2005. In 1986, the first major renovation was done to the firehouse. The four drive-through bays were replaced with five front-facing bays, and a meeting room, lounge and offices were added. The next year, a group of the fire company’s younger members recognized the need for a medical response team in Upper Makefield Township. This group of 13 obtained their state certification as Emergency Medical Technicians (EMTs) and got experience riding with different ambulance squads. In 1988, these firefighters initiated a “Quick Response Unit” to provide medical care to residents until an ambulance arrived. They slept in the firehouse every night so there would be a crew in station to get the truck out more quickly. This program worked well for many years and still is in limited service during major storms and when college is out of session. Station 81 opened at the Upper Makefield Township complex in 1988. 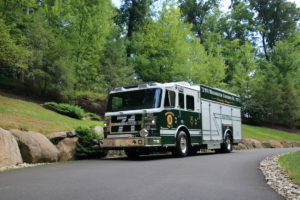 Originally a single engine station in the maintenance building at the rear of the complex, it housed the 1965 Mack (the first Engine 81), the 1969 Mack and the Pierce Lance rescue truck when it was purchased in 1997. The latter apparatus allowed UMFC to enter the rescue business—after significant member training to ensure proficiency. Prior to this point, the UMFC was dependent on small hand tools and neighboring mutual aid fire companies to perform rescues. That same year, the UMFC Fire Prevention Committee started a program to bring a fire safety message to children during the holiday season via the “Santa Parade.” Every year, approximately 1,000 bags with fire prevention coloring books, fire safety brochures, flyers from local businesses, pens, pencils and candy are tossed to residents’ children as Santa and his elves ride through the community’s many neighborhoods. Donations are collected from all businesses that put their flyers in the bags, so the event is self-supporting. UMFC also holds a canned food collection for a local food pantry on the same day as the parade. As a new century dawned in 2000, residential construction continued in the township. The UMFC saw the need for a swift water team and marine unit. Twelve dedicated firefighters began a training program, and the UMFC submitted grant paperwork to obtain a boat and trailer. After the grant was won, Marine 71 was placed in-service in 2003. The unit was put into almost immediate action in 2004, 2005 and 2006 when 3 major floods hit the area. During these floods and several minor storms, the unit has rescued numerous people. In 2010, a second boat was added, and in 2012 a storage room was dedicated for the gear and equipment due to the number of members on the team. Training for the swift water team is ongoing. In 2004, the UMFC worked with the Township to relocate Station 81 to a larger building closer to Eagle Road that has 2 bays, a lounge and bathrooms. In 2005, the UMFC purchased a new Pierce CAFS (Compressed Air Foam System) pumper to replace the 1985 Telesquirt. The CAFS technology makes the water carried by the pumper and tanker last longer—of critical importance given the number of residents who don’t live near fire hydrants. The second major renovation of the Taylorsville Road firehouse occurred in 2006. The red brick firehouse was somewhat out of place in the modernizing community, so an architect was hired to update the look, and ensure the storage and other needs of the UMFC were met. The current firehouse has six bays with an end bay serving as a drive-through for the marine unit. Other amenities include a large meeting room, lounge, and bunk-room on the first floor and offices, conference room, physical fitness room and storage areas on the second floor. 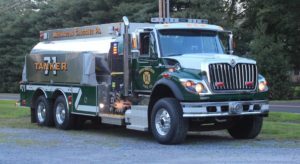 In 2009, the UMFC took delivery of a 3,000 gallon Freightliner tanker from Four Guys Fire Apparatus. With the delivery of this apparatus, the older 1988 tanker was relocated to Station 81 and began running as Tanker 81 to complement the engine already there. In 2010, the UMFC leadership recognized the need to better leverage communications technology to facilitate more timely responses to fire and other emergencies. The company procured a computer program called “I Am Responding,” which allows members to dial into a computer in each station after a call is dispatched. The Chiefs monitor this data in real-time via their smart phones, and use it to help ensure that the apparatus get out with as many staff as possible, and to redirect personnel to different stations as needed. In February 2013, members of the UMFC and some very motivated Upper Makefield Township residents started a new fundraising initiative called the “Italian Night and Auction” at the Washington Crossing Inn. Thanks to numerous donations from area businesses and residents, the first fundraiser was a success and has continued annually, with about $10,000 raised each year. Also in 2013, Upper Makefield Township entered into an agreement with St. Mary Medical Center to provide 24-hour Advanced Life Support (ALS) coverage to township residents with a crew of at least 1 paramedic and 1 emergency medical technician (EMT) on duty at all times. UMFC agreed to serve as a landlord to St. Mary, leasing living space for emergency personnel and garage space for an ambulance. On February 1, 2014, Squad 172 started operations at Station 71 under the direction of Chief Chris Reif and Doctor Gary Zimmer. This is a significant asset to UMT residents, since ALS service is only available in about 15% of Pennsylvania communities. In January 2015, the UMFC entered into an agreement with Rosenbauer USA for the purchase of a rescue engine to replace Rescue 71; UMFC took possession in spring 2016. The new Rescue 71 is equipped with state-of-the-art hydraulic rescue tools from Holmatro and a Compressed Air Foam System (CAFS) in the pump to assist with firefighting efforts. Upon Rescue 71’s arrival, the previous Engine 71 (2004 Pierce) was relocated to Station 81; today, each firehouse has a CAFS pumper and a tanker to serve residents. As the UMFC celebrates our golden anniversary, it’s time for reflection—remembering firefighters and other volunteers who have come and gone, the times we’ve shared, the many actions we’ve taken to serve the community—and for feeling satisfied and proud of a job well done, if only for a few moments. We’ve accomplished a lot in our first half-century, and look forward to the next 50 years.